We went to “The Marriage You Always Wanted” seminar last Saturday. 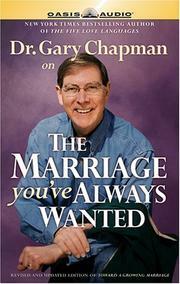 Dr. Gary Chapman gave us 3 questions that he said would transform your marriage. These questions really aren’t that novel. But they do mean that someone is taking a “servant” role in the marriage. This attitude communicates that you are committed to one of the great purposes of marriage – to make life better for the other. I can see how these questions would open the door to communication. They take us off the attack and put us in the position of wanting to be a life-helper for the one God has given us to love and serve. Try blowing your spouse away this week by asking one or more of these questions. And if they don’t believe you’re serious, keep asking it until he/she gives you a real answer. ← Why Is Prayer So Hard?